I love ranch dip and I love chipotle. Sounds like a match made in heaven, right. 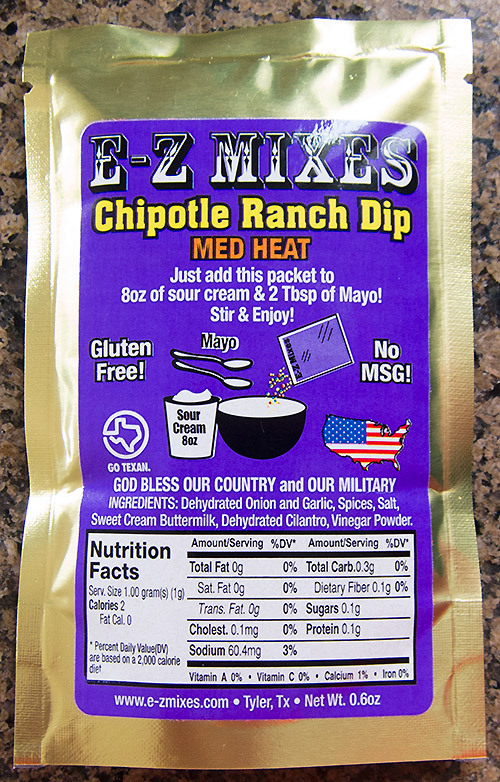 I’ve just devoured a whole batch of E-Z Mixes Chipotle Ranch Dip. I mostly had it with some tortilla chips, but in desperation I even had some with regular ruffled potato chips and the dip still rocked! Easy to make, just mix some sour cream and mayo. I recommend letting the dip sit in the refrigerator for two days. At first I didn’t like the texture and the flavor wasn’t there, but after two days in the fridge it was awesome.